Causes of hepatosplenomegaly is easy! I use the word hepatosplenomegaly as a guide. myeloproliferative diseases like leukaemia & lymphomas. I also remember other vital infections like CMV, hepatitis, rubella with it! Associated with cirrhosis of the liver and Budd Chiari syndrome. It also reminds me of other protozoal diseases like malaria, schistosomiasis & filariasis! 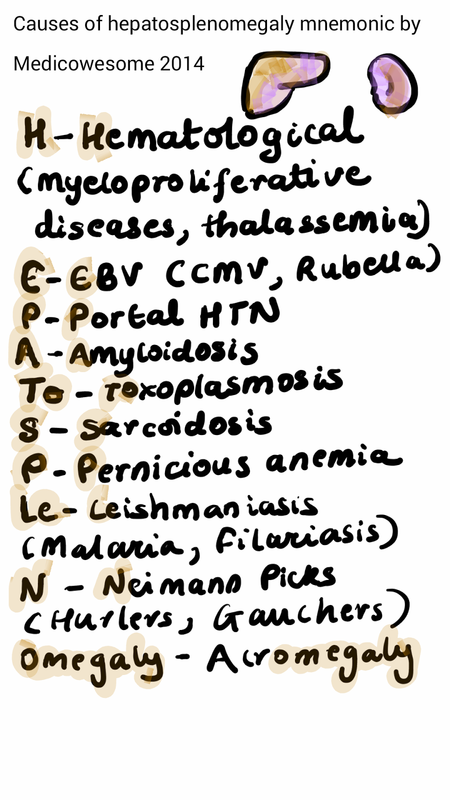 N for Niemann-Pick disease. Think of other metabolic diseases like Gaucher's disease, Hurler's disease. And finishing OMEGALY with Acromegaly! If you don't want to remember everything, just make sure you mention haematological causes, infectious causes, portal hypertension and metabolic diseases.